Which type of game I feel like playing wholly depends on my current mood. And sometimes, all I want is to sink into a good puzzle game. 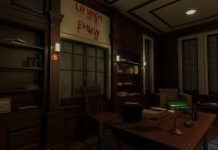 The type of game where you don’t have to pay attention to a story or a complicated character arc; where you can just jump straight in and be presented with a problem that needs to be resolved. Games like this speak to my analytical mind; a straightforward string of puzzles that need to be solved, and nothing more. Tetra’s Escape from ABX Games Studio is exactly this. 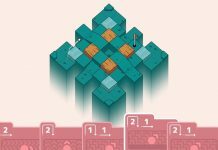 It’s far from perfect, but its level-based puzzles that all revolve around arranging blocks are ultimately satisfying to complete. Essentially, each level of Tetra’s Escape is about getting one block – a Tetra – to an exit. To reach the exit, you’ll need to use other Tetras in the level to create a path. 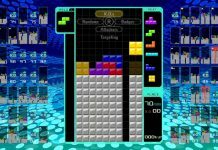 Most other blocks in a level will have a number of tetronimoes – you know, the different-shaped blocks that fall from the sky in Tetris – they can transform into. 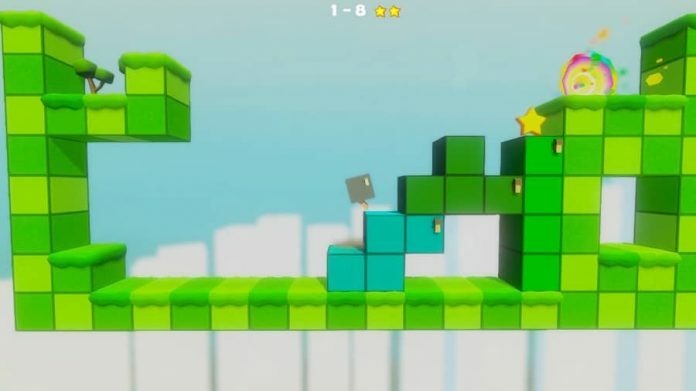 The puzzle comes in figuring out which blocks to use, and arranging and rotating them into the right position, in order to make a path to the exit. Like all good puzzle games, Tetra’s Escape starts out very easy. 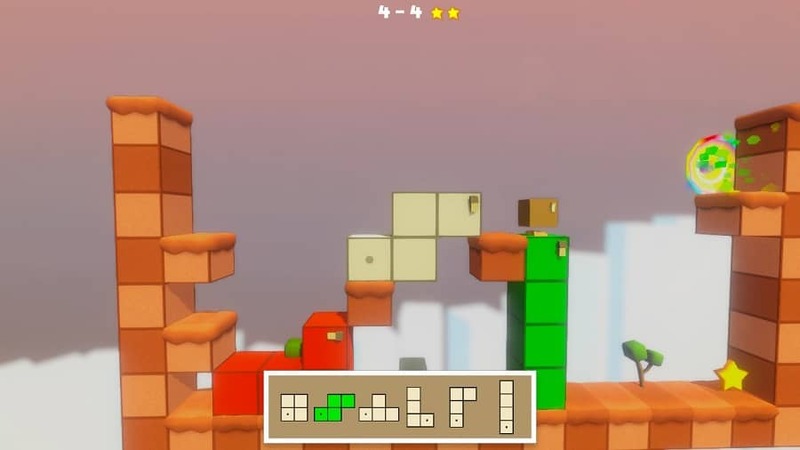 The first few levels introduce you to a couple of the game’s very basic mechanics. As you progress, new abilities and puzzle elements will be added, and the difficulty soon ramps up. There are a few uneven spikes in difficulty – a few super tough levels were followed by very easy ones – but generally, it ramps up at a steady pace. Every level – of a total of 64 – has three stars and one trophy to collect. You don’t need to collect any of them to move on; simply reaching the exit is enough. But it’s a welcome additional challenge for the completionists among us. Besides, the stars, which are laid out on a level as you start, can sometimes act as a helping hand, giving a bit of guidance as to where you should place your blocks. Once the three stars are collected, the trophy will appear in a set location. If you’ve solved the puzzle in the optimal way, you’ll have a clear path to it. If not, it may be blocked in somewhere. There comes a time, though, as more mechanics are introduced and Tetra’s Escape gets more complex, that you’ll probably abandon all hope of collecting everything. Simply getting to the goal can be challenging enough. I have to admit that I had to resort to a YouTube video to solve a couple of puzzles (sorry! ), but when you do figure out the solution to a particularly tough level by yourself, it’s a great feeling. The puzzles are by far the main – perhaps only – draw of Tetra’s Escape. It’s pleasant enough to look at, but its visuals are very basic and merely functional. It lacks a general amount of polish; the world map is inexplicably out of focus, and much of the tutorial text is poorly written. But it’s those puzzles that really count, and they kept me coming back for more, so everything else hardly matters. 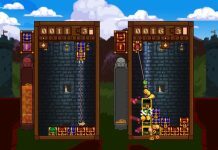 If you want something that’s fun to quickly dip into, and offers a brain-teasing challenge perhaps while something more meaty installs on your hard drive, Tetra’s Escape should fit the bill nicely. 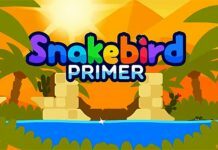 It’s a fun twist on other block-based puzzle games, and enough new mechanics are introduced at a regular pace that it never gets stale. Tetra’s Escape is available on PC, PS4, Xbox One, PS Vita and Nintendo Switch. We reviewed the Xbox One version.